This is an advertisement for Fell & Briant, label manufacturers. Before the 19th century grocers and small independent food stores made their own produce packaging food in jars and paper in small workshops at the rear of the store. From the 19th century larger companies started to mass produce and package food in large factories. Label manufacturers like Fell & Briant produced a wide variety of different labels and by studying these we can get a greater understanding of the 19th century diet. 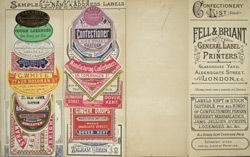 This leaflet features labels for cough sweets, ginger drops and confectioners.